This is a site full of information about the video game Harvest Moon: Back to Nature on the PS1. Back to Nature is, in my opinion, the best Harvest Moon game in the series. You’ll find information on this site about running your farm, interacting with characters, secrets and more. It’s incredibly hard and expensive to find a physical copy of this game now, however it was recently released on the Playstation Network as a PS1 classic for $5.99. If you download the game off the Playstation Network you can play it on either a PS3 or PSP. I highly recommend that you buy a PSP and use it to play the game. On the smaller screen the graphics look great and this is definitely a great portable game that you can play in short bursts. 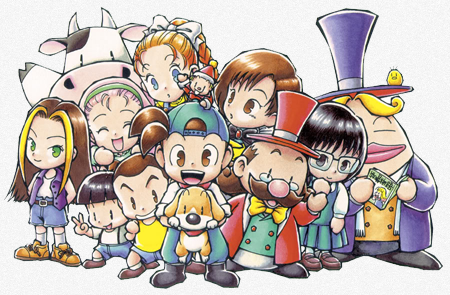 You’ll notice that the characters in this game are all from Harvest Moon 64. For whatever reason this game is essentially Harvest Moon 64 with different roles for the characters, a ton of extra features, a different town and less glitches and translation errors. I’m not entirely sure why they re-used all the characters and in a lot of cases I think the characters’ roles made more sense back in Harvest Moon 64. Popuri for example made a lot more sense as the girl at the flower shop instead of the girl at the chicken farm. Aside from that minor annoyance however you’ll find that Harvest Moon: Back to Nature for the PS1 (Playstation 1) is by far the superior videogame and the huge amount of changes and additions more than make up for the little character annoyances.